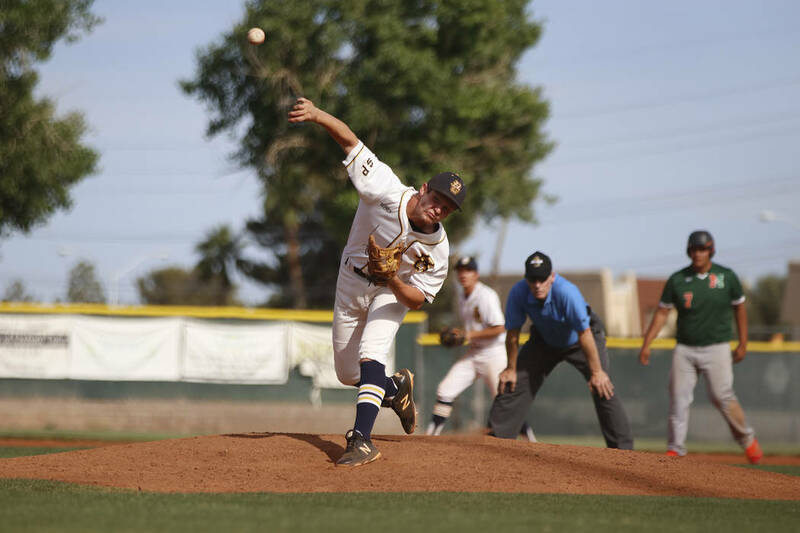 Three Eagles senior baseball players were selected to the 3A All-Southern Nevada first team after helping lead Boulder City High School to its fourth consecutive state tournament appearance. File Boulder City High School's senior starting pitcher Rhett Armstrong, seen in a March game against Desert Pine, was named to the All-Southern Nevada first team for his efforts this season. File D.J. Reese, a senior at Boulder City High School, seen pitching against Mojave in May, was named to the All-Southern Nevada first time. The infield trio of Rhett Armstrong, D.J. Reese and Chafton Temple each contributed heavily to keep the Eagles’ dominance alive and were rewarded for their efforts. Leading the team with a .430 batting average at the plate, Reese ended his season with 23 runs batted in, seven doubles and 25 stolen bases. On the mound the four-year varsity letter winner compiled a 3-2 record with a 3.23 earned run average and 32 strikeouts in 32 innings. A two-way star for the Eagles, McCann said Armstrong provided a key clutch gene multiple times this season, finishing with a .356 batting average with 21 RBIs, nine doubles and a triple. On the mound, Armstrong finished with a 5-2 record with a 1.38 ERA and 52 strikeouts in 55 2/3 innings. Adding another high quality bat to the lineup along with dynamic base running, Temple batted .358 with a team-leading 27 RBIs, 14 doubles and 25 stolen bases. 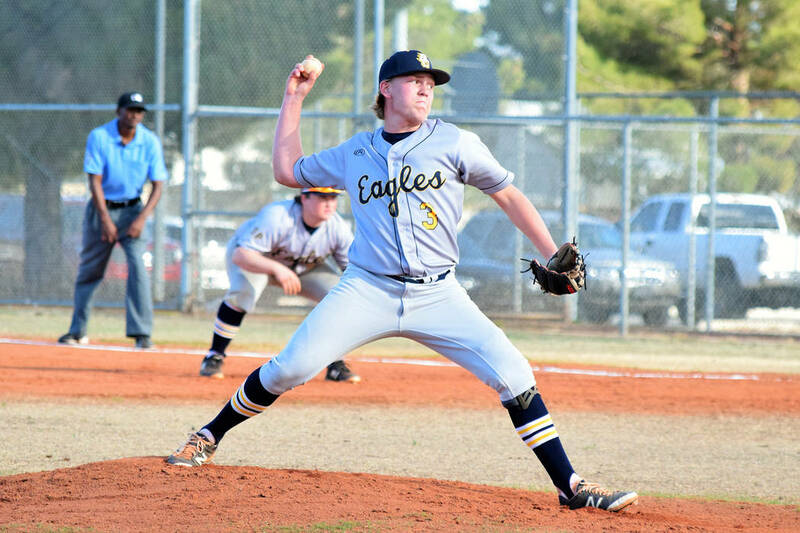 Making the 3A All-Southern Nevada second-team from the Eagles’ infield group was freshman Joey Giunta, who has the potential to follow the seniors’ path as the next great Eagle. Batting .340 with 17 RBIs and two doubles, Giunta also compiled a 3-2 record on the mound with a 3.19 ERA and 21 strikeouts in 26 1/3 innings. Senior outfielder Teddy Lobkowicz (.337 batting average, 26 RBIs, 10 doubles and 16 stolen bases) and junior catcher Jimmy Dunagan (.388 batting average, 16 RBIs and four doubles) also made the 3A All-Southern Nevada second team. “Teddy was big for us all year long,” McCann said. “I’ve seen a lot of improvement in him, coaching him this year after coaching against him last year. Rounding out the Eagles’ accolades, freshman pitcher Troy Connell was named second team All-Sunrise, after compiling 3-0 record with a 3.67 ERA and 14 strikeouts in 21 innings.